Simplicity is the key to true elegance symbol of delicacy and distinction. Discrete, versatile, informal. So delightfully refine, so romantically feminine. A big splash of colors for “Vanity Fair” bangle. Fluffy and ironic fur pompoms embellish the classic bangle. A versatile accessory whether worn over an every day look or to embellish with a touch of originality the most elegant dress. Rubies, quartz and cubic zirconia for a youthful and very feminine collection. Long chandelier earrings or delicate chanel necklaces, colourful like a rainbow, add an elegant flush of color and spring. Mediterranean passion. The collection tells a story that begins from the Mediterranean Sea, from its color and its patches of landscape: the green of its coasts and the blue of its sea bottoms race with the blue sky for a youthful and charming collection. Brightly colored, playful and full of movement. Stylish on the ears or and lovely on your wrist, the Tassel collection is the way to make your look trendy and fashion. When a jewel is the declaration of an unbreakable bond, a precious encounter to be sealed with a promise of love or of eternal friendship. A good luck wishes to a special person. Two souls in one, united forever. A celebration of life and its symbols: the swallow as metaphor of freedom, the leaf as symbol of growth and rebirth and the heart praise of love. Emeralds, Rubies and Sapphires, precious gemstones and delicate nuances provide a charming and elegant look to the woman wearing ROMA collection. 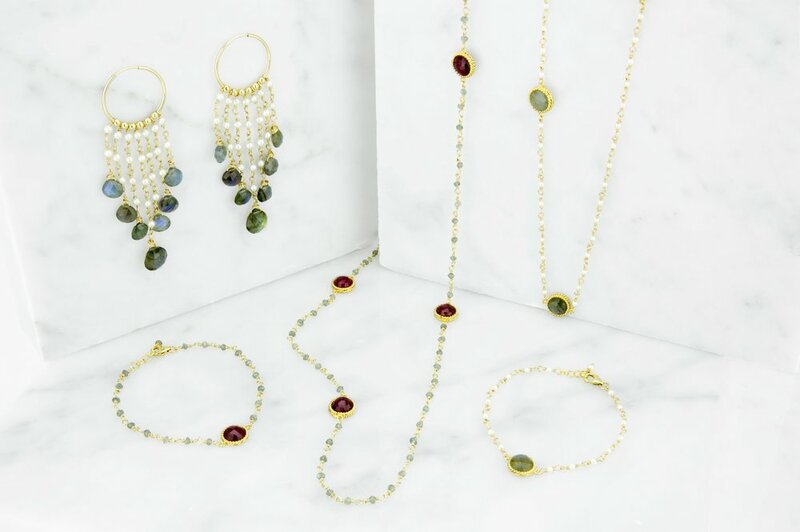 Each stone is bespoke cut by accomplished artisans and hand set to highlight its natural and individual characteristics, creating a beautiful and unique range of jewels. Stack ROMA jewels in many ways and layer them together for a unique look. Lightweight and evanescent waterfalls. You can brush it but it doesn’t allow you to really touch it. “Talita kumi!” which means in Aramaic language “wake up girl!” colorful cuff bracelets and pop rings for a collection offering light and liveliness, for reawakening the fun side of jewels to be worn as ornamental divertissements. Soft and rounded silhouettes for a combination of glamour, joy and femininity. Vintage design for a daring yet modern collection. Deeply rooted in many cultures, the Hand of Fatima also named Hamsa is known to ward off evil and negativity. It is a cross cultural amulet for good luck and protection that brings it's owner happiness, luck, health, and good fortune. Each Hamsa piece is handmade by our artisan using filigree technique in our studio in Italy. The Protected collection is a modern, glamorous translation of this timeless tradition. Wear a piece of this collection as your modern day amulet or use to bring luck, protection and good fortune to anyone who wears it. The classical twisted gold thread technique is declined in glamourous jewels. Bangles and rings that can be worn alone or in a stackable mix. Stylish and delicate pieces embellished by sapphire and corundum set by our artisan in a collection that is statement of style and craftsmanship.